100 Years of a Chinese University – Writer. Traveler. Tea Drinker. This past weekend my school, Jimei University, celebrated it’s 100th anniversary. Chinese universities don’t need much of an excuse to have a big celebration and this is a worthy milestone, so for months the school has been preparing for it. My school was started by a guy who was basically the godfather of Xiamen: Chen Jiageng ( also called Tan Kah Kee). I say godfather because he gave soooo much money to Xiamen, and so many buildings were built because of him, the architecture style of this area is is actually called Jiageng architecture. It’s characterized by red sloping roofs. Even though it’s been 100 years it is still the predominate style of this area and most new buildings in Jimei are built with this look, even the shopping malls! Chen Jiageng, the school’s founder. So Chen Jiageng made his money in Singapore, but as a Xiamen native he never forgot his hometown. 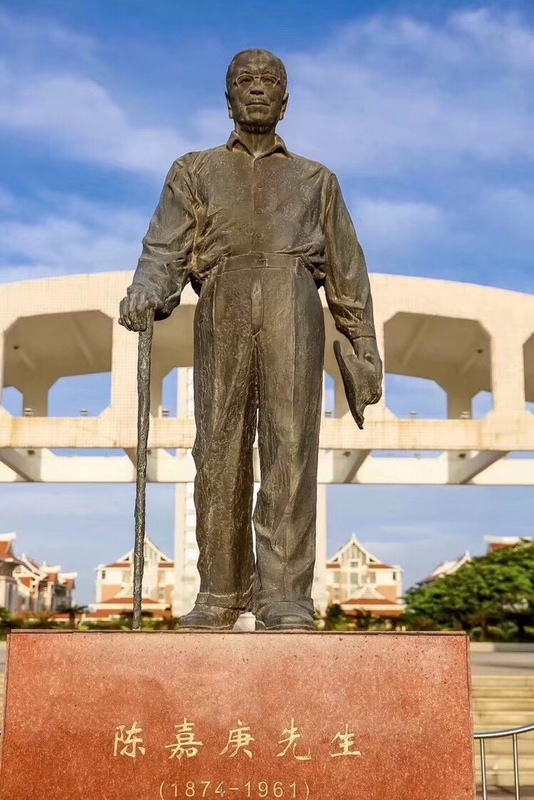 Most famous for both my university, and Xiamen university (one of the top ranked schools in the country) he also opened many primary schools in the area, one a year for more than a decade. It’s estimated he gave 100 million US dollars to education in his lifetime. Dammmmnnn that’s some cash. To celebrate the anniversary my school really pulled out all the stops. It’s kept in pretty good shape anyway, but all the lawns were mowed, all the bushes trimmed and 100’s of potted, blooming flowers were placed in various picturesque locations. They even put sprayers around the pagoda in the little lake making for very dramatic pictures. I snapped this pic on my way to class. It’s not morning fog, but actual sprayers attached to the pagoda underside that make the mist. The anniversary was on a Saturday, and students got a free lunch and a t-shirt (foreign teachers got neither, which I’m okay with) and there were many talks and assemblies. I wasn’t at my school that day, I was off playing in Shanghai, but the school was packed with current and former students, parents, visiting dignitaries and many teachers. My co-workers said that outside was mobbed and it was really just safer staying in and hiding from all the insanity. This school, it should be noted, is huge. There are more than 20,000 students and 2,000 teachers. It has 21 different departments and dozens of buildings spread throughout the district. It’s especially famous for marine stuff, like marine engineering and fisheries majors, but I would be remiss if I didn’t mention the sports college with one of the top badminton programs in the country. 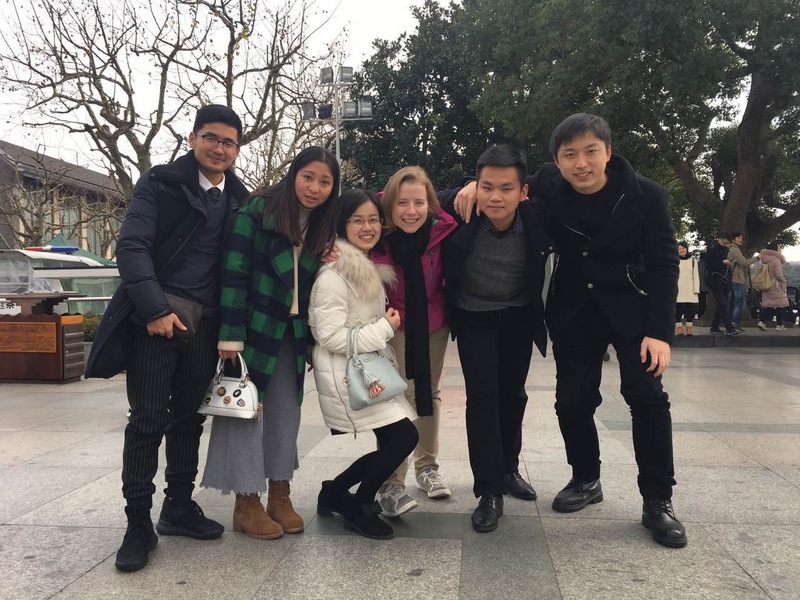 I met a traveler from up north who said that everyone knew Jimei had the top student players in the country. Oh yeah baby! This is my fifth year here and I have to say I like it. Of course my pay could always be higher, my apartment could be bigger, but this place is miles better than my last school, and out boss is really fair, really nice and treats us as good as she can. So I have no major complaints. Speaking of my last School, Zhejiang Agriculture and Forestry University, they celebrated their 60th anniversary on the same day! I thought it was a crazy coincidence until 3 friends, spread out across China, said it was the 60-90th anniversary of their schools too. I guess the government decided that this Saturday would be the “official anniversary day” of Chinese schools. So congrats to Jimei Uni for 100 years, and though I play a small role which will be forgotten in the passing of time, I’ve enjoyed my time here and wish the school another 100 years of success.